This paper provides an up-to-date picture of trends in the uptake of VET in Schools (VETiS) programs, the profile and participation of students who undertake VETiS programs, and the level and type of qualifications that are undertaken. It also reports on investigations into the education and training experiences of VETiS students five years down the track of their VETiS course. This part of the study uses a new data set which links 2006 data from the National VET in Schools Collection with data from the 2011 Census of Population and Housing. This linking provides a large number of observations about the destinations of VETiS students. In doing so it enables a closer look at the employment and further training destinations and experiences of VETiS students from various demographic, cultural and educational backgrounds. From the mid-1990s there has been an upward trend in student numbers in the VET in Schools (VETiS) program, including a recent rise in certificate III qualifications, with this pattern of steady growth in student numbers changing only slightly in the last few years. To date there has been limited study of the longer-term impact on participants of the VETiS program. As well as considering the longer-term trends in the VET in Schools program, this research looks at VETiS students in 2006 and asks the question: where were they five years later? In 2011, what jobs did they have and were these linked to their training, what other study had they done and is there a correlation between the VETiS program and their life pursuits after five years? By analysing a new and specially constructed dataset, which links data from the 2006 national VET in Schools Collection to data from the 2011 Census of Population and Housing, we have a platform that assists us to answer some of these questions. Linking these two datasets has provided a large number of observations about the destinations of VETiS students from various demographic, cultural and educational backgrounds, as well as their employment and their further training destinations and experiences. This unique data linkage has also demonstrated that this methodology has the capacity to provide a robust model for developing rich datasets with the ability to allow a deeper understanding of the outcomes from, and policy implications of programs akin to the VETiS program. The intent is to repeat the exercise with more recent 2016 Census data. The number of VETiS students has generally trended upwards over the 20-year timeframe, from 60 000 (1996) to over 240 000 (2016), although this pattern of steady growth has changed slightly in recent years. During this time, the proportion of Indigenous students has nearly doubled (3.2% to 6.0%) and we have seen the VETiS participation rate in government schools exceed that of non-government schools students. There has been an increase in VETiS apprentices and trainees over the time period, from 13 000 (1996) to just over 17 000 (2016). In 2016 numbers declined from the previous year. Certificates II and III were the most common qualifications undertaken in 2015, a change from the 2006–11 period, where certificate I was more popular than certificate III. The gap is widening between male and female participation in the VETiS program, with the number of males involved dominating. The three most popular fields of education in 2006 for VETiS students were: management and commerce; information technology; and food and hospitality. In 2015 information technology was replaced by society and culture as one of these top three fields of education. A key factor enabling this investigation into the labour market and further training destinations of VETiS students was the linking of the 2006 national VET in Schools Collection with data from the 2011 Census of Population and Housing. The linked dataset was constructed using the principles of deterministic linkage; that is, including in the linked dataset exact matches on responses common to both datasets. 13% were neither working nor studying. For a sizeable proportion of the students, especially those in trade-specific pathways, VETiS learning relates to the destination occupations and to the non-school qualifications undertaken following school. Sizable proportions of VETiS students go on to undertake and complete further studies, with considerable proportions undertaking these in the same fields as their VETiS studies. In 2011 approximately 70% of the 2006 VETiS students who had undertaken a certificate III or certificate IV in VETiS programs had completed a non-school qualification or were currently engaged in further studies. Around 10% of VETiS students went to university to attain a bachelor degree, thus demonstrating the dual functions of VETiS programs; that is, servicing the needs of the more academically able and interested and those of students who may be less so. Follow-up studies that include control group treatments to enable us to distinguish between VETiS students and non-VETiS students and to track their destinations in the labour market and education will provide us with evidence with which to assess the effectiveness of the VETiS programs more confidently. Updating the study by creating another linked dataset, ideally between data from the 2011 national VET in Schools Collection and data from the 2016 Census of Population and Housing will enable us to get more current information on destinations. More in-depth matching of intended qualifications and destination occupations (that is, at 4–6 digit ANZSCO level) will also enable us to make more definitive conclusions about the relevance of VETiS programs to employment and further training destinations. It would also be extremely useful from a policy perspective to assess the other non–labour market training functions that VETiS may perform in overall school operations, such as providing alternative pathways for specific groups of students in efforts to encourage engagement with education and training. Vocational education programs in schools, called VET in Schools (VETiS), were established with the specific aim of enabling students to undertake both nationally accredited vocational education and training (VET) programs (including part-time apprenticeships and traineeships) alongside programs that enable students to complete their secondary school certificates.1 VETiS programs lead to accredited VET qualifications. The effectiveness of such programs is an important policy issue: although we are able to consider the longer-term profiles and trends of the VETiS program and qualifications, as well as the characteristics of the student cohort, what happens to the students after they complete the program and how it supports them in their employment or further studies are of additional interest. To date, there has been little information about the longer-term outcomes of students who have undertaken a VETiS program. the uptake of VETiS programs since the mid-1990s, with a focus on the quantum and type of programs; the changing enrolment patterns in qualifications; and the characteristics of students. the further destination of VETiS students, by focusing on the employment and training outcomes five years after their completion of VETiS studies and the extent to which their occupations and further studies relate to their VETiS program. The uptake of VETiS programs over the last two decades has generally trended upwards, while the diversity of the programs in which students are engaged has broadened. Historically, VETiS students have been mostly engaged in certificate I and II qualifications; however, during the last few years we have seen an increase in certificate III qualifications, suggesting that VETiS is focusing on offering students more specific skills and skills of a higher level than previously. A key factor in enabling the investigation of the further destinations of VET in Schools students was the construction of a new linked dataset. This was made by linking data from the 2006 national VET in Schools Collection, held by the National Centre for Vocational Education Research (NCVER), to data from 2011 Census of Population and Housing, held by the Australian Bureau of Statistics (ABS). The approach employed during the assembly of the linked dataset was based on deterministic linkage, whereby exact matches on responses for variables common to both datasets are linked. Successful matches were made for over 50% of the in-scope VETiS records, resulting in a substantial sample of students for the analysis. 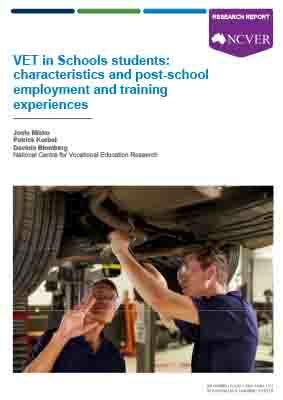 While there have been previous studies which focused on identifying post-school employment and training for VETiS students and the personal development benefits accruing from participation (Misko & Slack 2004; Polesel, Helme, Davies, Teese, Nicholas & Vickers, 2004; Polesel, Teese, Lamb, Helme, Nicholas & Clark 2005; Black, Polidano & Tabasso 2011; ABS 2014), many of these studies have been constrained by the use of datasets of small numbers of VETiS students. This large, linked dataset provided the opportunity to expand the number of data segmentations more finely than had previously been possible. This meant that we were able to examine the relationship between what students did in their VETiS courses and their post-VETiS employment and further studies. The combination dataset provided the platform for a comprehensive investigation of the actual differences in the employment, income, occupational and further training outcomes of different groups. It also enabled a matching of VETiS training to occupational destinations or further studies in similar fields and the opportunity to demonstrate the relevance of VETiS programs to occupations and further training for participants. To provide context for the linkage study, a profile of VETiS according to student background characteristics and participation rates for different groups was developed from previous research that investigated the success of VETiS programs and provided trend data. To obtain a more comprehensive analysis of VETiS uptake and offerings, we provide an up-to-date analysis of the national trends in participation, the level and type of qualifications undertaken by students in VETiS programs, and the qualifications that are on offer to meet changing industry and occupational structures. The research shows that the number of VETiS students has trended steadily upwards over the last two decades. In 1996 (when new approaches to vocational education in schools were being adopted) 60 000 students were undertaking such courses; by 2006 this had increased to around 170 000, and by 2016 the number had increased to just over 243 000. In the last few years the pattern of steady growth has slowed; in 2014 and 2016 the numbers declined from the preceding year. In 2015 numbers had climbed to over 250 000. The proportion of Indigenous students has doubled across the period, from 3.2% to 6.0%3; their participation rate by comparison with non-Indigenous students is also substantially greater. Participation rates are also substantially higher for students from government schools by comparison with non-government schools (and more so for independent schools). The number of VETiS apprentices and trainees has increased from 13 000 in 2006 to just over 20 000 in 2015 – a slight drop from 2014 figures; in 2016 numbers stood at just over 17 000. Queensland has the highest numbers. Certificate II qualifications, followed by certificate III, were the most common qualifications undertaken by VETiS students in 2015. Certificate III qualifications experienced an increase from 2010 and a significant increase from 2012, in 2015 accounting for just under 80 000 students compared with 140 000 for certificate II qualifications. Between 2006 and 2011 certificate I qualifications always outnumbered certificate III qualifications as the second most populated qualifications; after that time certificate III qualifications occupied second place. Over the period, however, there was low uptake of certificate IV and diploma qualifications, although some minimal increases have occurred in recent years. When we compare the qualifications undertaken in post-school VET by comparison with VETiS, we find that the former accounts for substantially higher proportions of certificate III, IV and diploma qualifications, while VETiS accounts for higher numbers of certificates I and II. In 2006 and 2010 the management and commerce field of education (FOE) was the most popular for both VETiS students and VET students in general. In 2015 it was surpassed by society and culture for VETiS and engineering and related technologies for VET. In making these comparisons it is important to note that VET students have a different age distribution from VETiS students. When we compare similar age groups (that is 15 to 19-year-olds) however there is a similar pattern, with post-school VET students more likely to be undertaking certificate III and above qualifications and VETiS students the lower-level certificates. A main aim of the VETiS program is to give students a head start in the labour market by providing them with training that combines classroom-based learning with experience in actual or simulated workplaces, but which also enables them to complete their secondary school studies.4 We can say that the program has been effective if students get a job when they move into the labour market. Using the linked dataset, we determined that a significant majority (78%) of the 2006 VETiS participants were in a job in 2011, that is, five years after their studies. Of these, 29% were also studying; 9% were studying only; and the remainder (around 13%) had dropped out of education and were not looking for work (13%). We call this latter group the ‘not in employment, education and training’ (NEET) group. It is also clear that students with certain background characteristics seem to be more successful in gaining employment than others. Of those who were employed or looking for work, students who had undertaken diploma and above qualifications, apprenticeship or traineeship programs, and were from catholic and independent schools had a higher success rate. Indigenous students, those who were predominantly non-English speakers in the home, 19-year-olds and those from other government schools (especially from ‘other government providers’) had the lowest success rates. There are some limitations to the observations that must be noted. Not all influencers or characteristics were available in the linked dataset, such as information relating to personal characteristics, including cognitive ability, motivation, parent occupation or business ownership (to facilitate uptake of apprenticeships and traineeships), and family and friendship networks. In addition, the state of the labour market during the period under investigation was not explicitly considered. It is recognised that the labour market or geographical location in which job search is undertaken may also be a contributing factor to success or failure in finding employment. The great majority of VETiS students (regardless of background characteristics) do not end up in trade occupations. Nevertheless, of those who do, males are over six times more likely than females to enter the trades. These findings are supported by our statistical modelling, which indicates that, by comparison with their various counterparts, the most likely groups to end up in trade occupations were males, those who were in an apprenticeship or traineeship, and those who primarily speak English in the home. The majority of 2006 VETiS students ended up in a job, although the data do not indicate whether they were in a good job (that is, one that earns a good income). We identified what constitutes a ‘good job’ by changing the cut-off points between a high-paying job and low-paying job. The first cut-off point between a good and a poor-paying job we look at is an income approximating the 2011 minimum wage ($31 200); the second lifts the bar much higher, to $52 000. Over three-quarters of all 2006 VETiS students (with the exception of those who were 15 years old in 2006) in full-time employment earned incomes over $31 200 (this is true for just over two-thirds of the 15-year-olds); however, there were still between 15% and 33% who were earning wages below this income level. Why this was the case is a question for further investigation. When we raised the income bar to over $52 000, the proportion of workers who earned incomes of this level dropped considerably for all groups across all ages. The great majority (between 70% and 85%) earned less than $52 000. The results of our statistical modelling, based on a good income being over $52 000, show that an income above this level is rare and variability between different groups is also low. By comparison with their counterparts, high incomes of this level are more likely for males, 18 and 19-year-olds, apprentices and trainees and students from outer regional and remote and very remote areas than those from the major cities (presumably because of the better-paying jobs in the resources sector). Although statistically significant, the differences were often slight or minimal however and point to influences that cannot be captured by the linked dataset. When VETiS studies lead to jobs in course-related occupations and or industry sectors it can be said that there is a good alignment between the two. This is an important policy issue, as the key aim of all programs, vocational and general, is to ensure students have the requisite skills and knowledge for a job in their preferred occupation or industry. We found that a sizable proportion of the 2006 VETiS students (more so for those in the trades than in the non-trades) were in course-related occupations in 2011. That is, their jobs were in the same broad fields or related occupational areas as the intended occupations of their VETiS qualifications. However, no such connections exist in another group of VETiS students, which would suggest that VETiS may be playing a role other than a specific vocational role: VETiS may be acting as a ‘try before you buy’ mechanism, with students ultimately deciding that this type of work is not for them – meaning that they do not search for jobs in those areas. In this study we conclude that the single most common destination (accounting for a quarter of VETiS workers) was technician and trade worker. But if we combine occupations that deal with the provision of services – sales workers, community and personal service workers and clerical and administrative workers – we find that they account (in almost equal proportions) for just under half (48%) of all VETiS students employed in 2011. Labourers, followed by professionals, each account for about a tenth of the VETiS workers, with labourers more common than professionals. Understandably, the smallest groups of VETiS students are found to be employed as managers and machinery operators and drivers, given their lack of experience. The majority of VETiS students were found in 20 training programs (comprising 19 training package programs and one group of a combination of non-training package programs). All ANZSCO5 occupations (at the major group level) were recorded as occupational destinations in varying levels of uptake across students from training and non-training package programs; however, some occupations (mainly managers, professionals, and machinery operators and drivers) were never mentioned as top or runner-up occupational destinations. Labourers are runner-up destinations (but at a much lower level) for a range of trade-specific training package programs. The most common destination was technician and trade worker. It was the top or runner-up destination for 60% of programs and mentioned among the more frequent occupations in 95% of programs; it was always at the top for trade-specific programs. The top destination for around 32% of the programs, and top or runner-up occupation for 35% of the programs was the sales worker occupation. Just three of the training packages had community and personal service worker as the top destination, but almost half had it as a frequent destination. The top destination for just one of the training packages (the Business Services Training Package) was clerical and administrative worker; however, it figures as a frequent destination for 50% of the programs. The Electro-Technology Training Package is the highest, with 63% of its 2006 students moving into technician and trade jobs in 2011. The Automotive Industry Retail, Service and Repair and the Metal and Engineering training packages have 53% of students moving into technician and trade occupations. The Construction, Plumbing & Services and Integrated Framework and the Furnishing training Packages have about half of their students moving into technician and trade jobs (50% and 49% respectively). Close matches were less frequent for the Community Services and the Beauty training packages, with 36% and 29%, respectively, of students moving into community and personal service worker jobs. Between 15% and 24% of students from the Retail Services, Information and Communications Technology, Business Services, and Tourism, Travel and Hospitality training packages ended up in closely aligned occupations. In relation to a lower level of close alignment, it was determined that 34% of students from the Agriculture, Horticulture, and Conservation and Land Management Training Package moved into jobs with some alignment (that is, trade and technician jobs); 22% of hairdressers became community and personal service workers; 13% of information technology students moved into jobs as clerical and administrative workers; and 23% of tourism, travel and hospitality students and 20% of sport, fitness and recreation students moved into jobs as community and personal service workers. There was no close or near alignment for students from training package programs for screen and media; property services; music; live performance and entertainment; and arts and culture. VETiS students were employed in all ANZSIC7 industry sectors in 2011, with half being employed in four industries: retail trade; accommodation and food services; construction; and health care and social assistance industries, industries not primarily concerned with the making of products or goods but with the sale and provision of goods and services. Being attached to the education and training system following school is considered to be a favourable outcome for any secondary school program, as it opens up pathways to employment, as well as better paying jobs. Of the 2006 VETiS participants who by 2011 had attained a non-school qualification, just over half (54%) had gained a certificate III or IV qualification, 18.2% a VET diploma and another 18.2% a bachelor degree or higher. Just 9.6% had attained a certificate I or II qualification. Sizable proportions of 2006 VETiS students continued on with further studies and did so in the same broad fields of education. This is also a positive finding and indicates that for some students their VETiS is providing training that is relevant to post-school education pathways. Almost a fifth of 2006 VETiS students who completed a non-school qualification went on to attain bachelor or higher qualifications. This indicates that VETiS may be catering for two types of students. The first group comprises those with higher academic ability and academic aspirations; the second, those of lower academic ability or academic aspirations. The more academically oriented may be choosing to do VETiS to access specialist facilities and equipment (for example, equipment for developing plastics and polymers, or for constructing 3D printing models, creative arts materials), or because they’re interested in entering special vocational pathways. It may also be the case that the availability of articulation pathways between some secondary schools and universities makes it easier for VETiS students to access university studies. With few exceptions (Indigenous students, and students from remote or very remote locations), well over half (mostly between 57% and 69%) of the students had gained non-school qualifications and were continuing to engage in further studies. We can use our data to delve more deeply into the extent to which students who go on to further studies undertake studies in the same fields of education as their VETiS programs. When we do this we find that the match rate was best for 56% of students who did studies in Engineering and related technologies; 47% of those who did studies in Architecture and Building, and 40% of those who did studies in Management and Commerce. There was also a match for around 30% of those students who undertook studies in Health; Society and Culture; and Food, Hospitality and Personal Services. Here we also note that the field of education classifications we used are at the broad rather than the narrow or detailed fields of the ASCED8 classification. The increase in the uptake of certificate III qualifications in recent years may be attributable to two factors: firstly, schools wanting to ensure that students have the opportunity to enter the workforce with some higher-level skills, making them more marketable; and, secondly, jurisdictions might be promoting these higher-level courses to enable students to gain more points towards the completion of secondary school studies or to boost university entrance scores. Certificate III programs are also focused on a wide range of technical programs, contradicting some views that VETiS programs are holding bays for the non-academically able or interested. The fact that students are undertaking programs in areas such as enrolled nursing, health and patient support services, concreting, construction, electro-technology and engineering reinforces the fact that VETiS is providing students with skills relevant to changing labour market structures. The results of our statistical modelling indicate that in comparison with their respective counterparts, those most likely to attain a non-school qualification or be currently engaged in studies are females, non-Indigenous students, students who mainly speak English in the home, apprentices and trainees, and those students who live in a major city. A certificate III/IV qualification is also more likely to lead to a non-school qualification and engagement in further study than is a diploma or certificate I/II qualification. The type of school attended and the location of the student’s usual residence will also have a bearing, with students from non-government schools more likely than those from government schools to achieve at this level, and those from major cities more likely to do so than those from remote or very remote areas. An uncertain factor is the state of the labour market when students are looking for work, meaning that they take jobs where they can. Furthermore, the findings are a consequence of only considering occupational classifications at the ANZSCO major group level, which may underestimate the relationship. A follow-up study which uses the 4-digit or even 6-digit ANZSCO qualifications may be more informative and may enable us to make finer segmentations. Our linked dataset connects 2006 VETiS data from the national VET in Schools Collection to data from the 2011 Census of Population and Housing. Use of the latter means that the 2011 employment and training data are dated and may not be a true reflection of the current situation. Repeating the exercise by linking the 2011 data on VETiS to the 2016 census would provide a more up-to-date view of how the labour market operates for 2011 VETiS students. We have been unable to use the employment and training outcomes for the 2006 VETiS students to make claims about the effectiveness or otherwise of our VETiS programs. This is because we have been unable to source a true control group of students, those who did not do VETiS studies in 2006, or a valid proxy for these non-VETiS students. This gap might be filled in a variety of ways. The most productive approach would be to access administrative data on students (both VETiS students and non-VETiS students) from state curriculum authorities (or their equivalents), which capture information on performance in national literacy and numeracy tests (that is, NAPLAN scores), as well as student performance on international tests. In addition, various states also have tracker studies that follow the fortunes of their senior secondary students on leaving school (for example, Queensland and Victoria). We might use data from the Longitudinal Surveys of Australian Youth (LSAY), as this source has the capacity to provide us with some good measures on cognitive ability, educational attainment and parental education and occupation. We looked at occupational destination at the 1-digit level of ANZSCO; further work would benefit from expanding the occupational categories to include specific occupations (perhaps at 4-digit and 6-digit levels of ANZSCO classifications). We also looked at the broad fields of education of programs undertaken by VETiS students. Using the narrow or detailed fields of education (at 4-digit, 6-digit or higher) may enable us to establish with more certainty whether or not there are matches between what students do in their VETiS studies and the further studies they undertake. A closer investigation of the national VET in Schools Collection to determine the actual qualifications being undertaken by those students who go on to get a bachelor degree will also enable us to understand the interests of these students. Knowing a little more about how their VETiS studies have helped them to acquire these skills will also help us to understand the real impact that VETiS programs have on further education and training decisions. 1 In 1996 new school-based apprenticeships were introduced into the school-based VET. This often involved students starting a part-time apprenticeship while still at school and receiving payment for that part of the time spent in the workplace. 2 The ABS noted that this rate of linkage was lower than that for other education and training data linkages. 3 Over this period of time we note that the proportion of ‘not known’ Indigenous status has also dropped. 4 For example, in school kitchen facilities for commercial cookery programs or school administration centres for information technology or business services program. 5 ANZSCO = Australian and New Zealand Standard Classification of Occupations. 6 At ANZSCO major group level. 7 ANZSIC = Australian and New Zealand Standard Industrial Classification. 8 ASCED = Australian Standard Classification of Education.